Sporadic small explosions and ash emissions continue, but at lower levels than during past months. Ash emissions of low intensity continue from time to time at Reventador. The lava dome is most likely continuing to grow, but direct observations are often impossible. IG experiences technical problems with the seismic station at the moment. Seismicity has recently decreased and become more discontinuous. A steam plume was seen rising about 1 km above the crater during a (rare) window of clear weather on 16 Dec.
A strong pulse of volcanic tremor and volcanic earthquakes occurred earlier today, suggesting a possible small emission. Visible observations remain difficult due to cloud cover and there are no other reports of activity. While direct observations are usually impossible due to cloud cover, seismic tremor pulses and explosion signals indicate ash emissions occasional mild explosions continue. Compared to November, the activity has decreased, but weak explosions with small ash emissions continue, accompanied by moderate seismic activity. 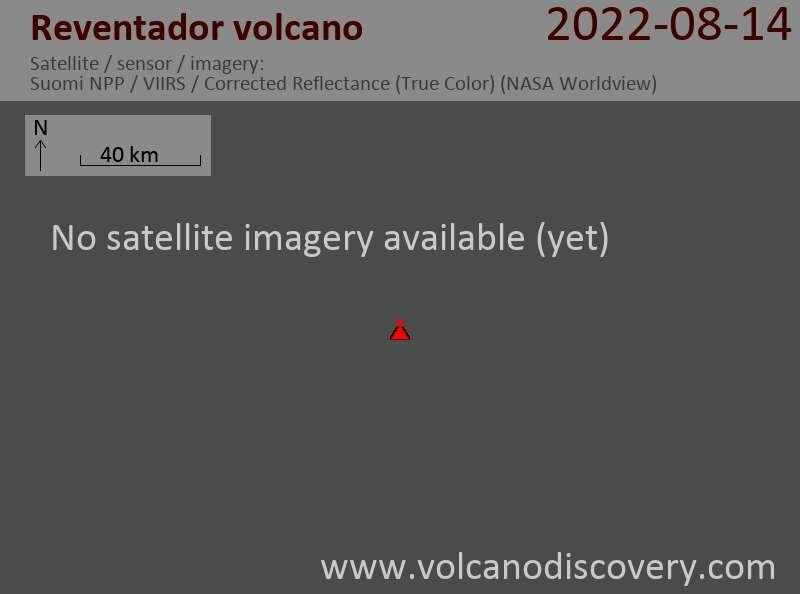 During the first months of 2012, the volcano started to produce lava flows and build up a new lava dome that has by now over-topped the Nov 2002 crater rim. Over the past months, there has been a steady in crease. The lava flows traveled as far as 2 km down the N and S flanks, and steam plumes rose 200-500 m above the crater. Field visits by volcanologists in recent months confirmed that the lava dome in the crater had continued to grow above the rim, becoming the highest point of the volcano. Blocks from the lava dome and lava-flow fronts rolled down the flanks. IG noted that during 3-4 November emissions increased; a steam-and-ash plume rose 3 km above the crater. The seismic network detected an increase in the magnitude of volcanic tremor. Steam-and-gas plumes contained ash within the previous few days. The volcano observatory reported an new ash emission reaching 17,000 ft (about 5.2 km) altitude, i.e. an ash plume rising about 2 km above the volcano. At about 0400 on 5 November a steam-and-ash plume rose 3 km. An ash plume rose 2 km and drifted NW at 0600. Eruptive activity probably continues at Reventador. During a rare window of clear weather, a steam column was seen rising 3 km from the crater on 3 Oct. The seismogram shows intense activity as well. A large steam plume is rising up to about 1.5-2 km from the volcano and sometimes contains ash. Yesterday morning, a steam and ash emission less than 1 km in height was observed from the volcano during a (rare) window of clear weather. A steam emission of 1 km height was observed yesterday during a rare window of clear weather. Mostly the volcano is hidden in clouds and IG has no seismic data available, but last night, energetic steam emissions were observed. A 2 km high steam plume is rising from the volcano, IG reported last night. The volcano was seen producing a steam plume rising 2 km. No seismic data are available as the station is damaged. On the afternoon of September 6, strong steaming was observed producing a plume reaching 3 km height above the crater. The plume contained some ash and during the night 6-7 Sep, an explosion was observed that ejected incandescent material which fell on and outside of the northwestern crater rim. The next morning (7 Sep), steam and minor ash emissions produced plumes between 1-3 kim height.